The AVR platform has a very handy feature called DebugWire that lets you connect to a chip using only a single pin. Using just this single pin, you can reprogram the chip without having to remove it from the circuit. To use DebugWire it must be enabled on the chip using a fuse. The only documented downsides to using the DebugWire interface are (1) you loose the use of that pin which is otherwise a reset pin or an IO pin, and (2) the chip will use an additional ~3mw of power even when sleeping. I think I found another impact of enabling the DebugWire interface – it makes your WatchDog timer take longer to expire. These tests were all done using the same physical chip at constant temperature (~70F) and constant supply voltage (3.0V). So it looks like the DebugWire adds about 7ms extra time to the WatchDog timer. This might not sound like a big deal, but at the 16ms setting this more than a 40% error. In my case it was making me very confused. I eventually gave up trying to figure out what was wrong and adjusted everything to the new timeout so that it would work. I finally figured it out when I programmed up a production chip without DebugWire enabled to test power consumption and that didn’t work right. Turning on DebugWire fixed it. I’ve never seen this issue documented before. Let me know if you find any mention of it that I missed! This looks very simple and it is, but there is a lot of work hidden in there. It turns out that computers as small as the ATTINY used in the Ognite do not know how to multiplication and division. Wow, dividing and multiplying by 3 is hard for a binary computer. Wait! What if we added an extra wasted cycle into each loop to make the total 4? This would mean that now we would need 4 cases for remainders and an extra instruction in each case’s loop. Normally we would never want to *add* more code, but in this case the little bit of code we add will eliminate a bunch of code elsewhere. Here is the new generated code for dividing by 4 to find the loop count and remainder…. Wow, that is so much shorter faster and and simpler! But we did have to add a bunch of other source code to pad out the loops and add new cases. Was it a win overall? Yeay! We had to add a lot of lines to the program, but the resulting compiled code is both smaller and faster! The Ognite does not use any current limiting resistors, instead it turns on the LEDs for *very* brief moments of time. The longer the LED is left on each time it is flicked, the brighter it looks. This is called PWM. Normally this is done by dedicated hardware, but because of the way the Ognite LEDs must be multiplexed, the chip has to do PWM the hard way- by actually turning the power on, waiting, then turning it off. It is important to do this very accurately and very quickly. A dim LED on an Ognite only gets turned on for 0.000000125 seconds at a time! At this time scale, you have to take into account how much time it takes to think when doing anything. Just deciding if it is time to turn off the LED can take longer than it should be on for. If the LED needs to be on for 1 or 2 cycles, there literally is not time to decide or check anything while the LED is on, so instead the program gets everything ready and then turns the LED on and then off in one swift and single motion. The code that does this needs to take into account how long each and every instruction takes and balance them out to make sure that the LED is always on for exactly the right amount of time. Below is the code that will turn on an LED for exactly the specified number of clock cycles (there are 8,000,000 clock cycles in one second on the Ognite). It is this level of fine brightness control that gives the flame its lifelike motion. Your eye translates the smooth fades in and out into a continuous moving image, rather than a bunch of blinking lights. We spend most of our time inside the display refresh, so let’s see if there is any more we can squeeze out there. The current refresh code is very simple and fast. It has nested loops that scan the X and Y axis. For each pixel it loads the brightness value and then looks up which pins drive to light up the appropriate LED. First we can move the lookup tables from program memory into SRAM. This should save 1 cycle on each lookup, and might be even faster since there are more registers available than can be used for SRAM lookups…. There are two costs to this change. First, we are using up 26 bytes more of SRAM, but this is ok because we have plenty of SRAM to spare. We are also using up a bit of time when the values initially get copied from program memory into SRAM, but this only happens once each time we get turned on so that’s ok too. Very small win, but no sacrifice at all so we’ll take it. Note that this only work becasue the compiler does not treat the PORT registers as normal registers – it could. Using the temporary cache variables lands these values in proper registers that the compiler feels comfortable with. Next we can also cache the value for the ColBits lookups…. This one is a sad victory. We really have not changed the algorithm or flow at all, just moved around some code. Apparently this helped kick the compiler into seeing something. It is arbitrary and capricious and really reinforces the idea that we are going to have to do bare-metal assembler if we really want to get to the best possible code here. All told, we traded about an hour of effort for 42 bytes of program space and about 17us of time on each screen refresh (about 13% savings). We could get maybe another 20% reduction by hard coding in some knowledge about where the pins land in the current design and thus skipping some lookups. Until the battery holder problem is solved, I want to keep all options open. Greatly reduced power usage. Thanks to the new WatchDog reset driven sleep modes, Ognite now draws only about 0.75mA while running. This should translate to months of operation on a couple of AA batteries. Diagnostic Startup Screen. This really helps find connection mistakes. I build a lot of Ognites, and I’ve even found a few bad connections that I’ve made thanks to this screen. Really work on optimizing driving LEDs for brightness vs. power. The LEDs currently use up 7x more power than the chip, so this is where real battery life gains will come from. This is all empirical work, trying different power levels and driving modes to see the trade offs on perceived brightness. The relationship is completely non-linear, so this takes a lot of time to work out. Re-encode the flame from better source material. I have some video that I took using a better camera than I need to process to get a higher quality flame both ion terms of pixels and flame action. There is still also lots of room for improvement in tightening up the firmware. Ultimately, I am going to translate everything into straight assembly language and that will likely give at least 25% reduction in size and time – although admittedly these gains are almost purely symbolic since at this point they will not make a noticeable difference in the final product. Microcontrollers typically use on the order of milliamps when they are running, so if you want to make a battery last more than a few days, then you need to make sure that the processor is running as little as possible. This means you should almost always be sleeping. On the AVR microcontrollers, this typically means setting the WatchDog timer to wake you up, and then going to sleep. You can set the WatchDog to wake up anywhere from 60 times per second, to only once every 8 seconds depending on what you need to do. Once the WatchDog triggers, you need to wake up as fast as you can, then do what you need to do, then go back to sleep. It turns out that correctly setting the SUT fuse bits can have a huge impact on how long it takes you to wake up each time, and this can have a huge impact on how much power you use overall. Correctly setting the SUT fuses is critical for minimizing power when using sleep modes. The default setting adds a delay of 62 milliseconds to every wake up, and the processor uses about 5mA during the delay. Lets take a look at a possibly the smallest possible wake up task to highlight this. All this program does when it wakes up is turn on a pin (so we know it is working), get everything ready to go back to sleep, turn off the pin, and sleep. We are just needlessly burning juice during this entire 67ms delay! The little “T” is spot where we turned on the pin (and triggered the scope). The pin is on for such a sort amount of that we can not even see the yellow trace go up at this scale (10ms/div). The trace is showing the chip’s current usage. 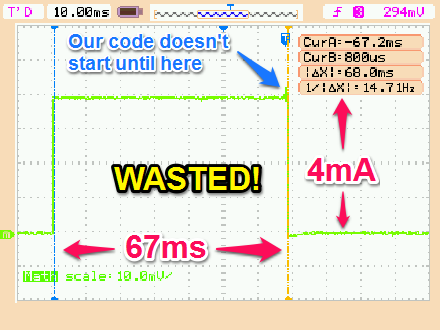 See how it the chip starts using power more than 67ms before it actually wakes and runs our code? This is terrible! What is going on? It turns out that the chip has a feature that delays the chip from running any code for a while right after it wakes up. The idea behind this is to let everything settle down and smooth out before it starts. By default, it waits ~62 milliseconds. This is a good idea when, say, you are running off a power supply that takes some time to stabilize. It is a terrible idea when you are just waking up for a tiny moment to do something and then go back to bed. According to the math, we are wasting about 0.25 milliampere seconds every time we wake up. That adds up fast. If we are waking up 4 times per second, the delay will be wasting an average of 1mA all the time! The Ognite runs off a nice stable battery , so we don’t need any delay. Even if we did, it would be much better to maybe use the Brown Out Detector to delay our startup since we could then disable it once we were up and running and then not need to endure the delay everytime we woke up from a WatchDog. * sleeping and do ongoing work only when woken by a WatchDog reset. 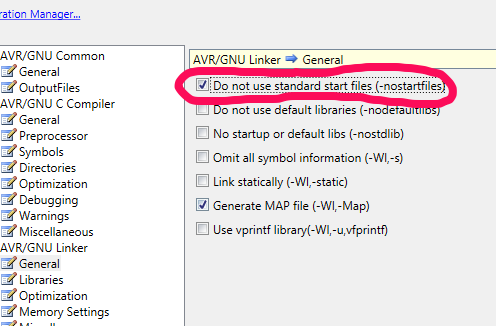 // In warmstart we will set it recurring timeout. // always enter warmstart from exactly the same reset state for consistent timing. // If you plan to do work for longer than the WatchDog timer, then you need to do a WatchDogReset (WDR) occasionally to keep the timer from expiring on you. Note that this can add jitter if consistant timing is important. // which might not be long enough for us to do what we need to do. WDTCR = _BV( WDP1) | _BV( WDP0) ; // This sets a 125ms timeout. See the table of timeout values in the datasheet. Note that you can delete this line completely if you want the default 16ms timeout. // After a WDT reset, the WatchDog should also still be on by default because the WDRF will be set after a WDT reset, and "WDE is overridden by WDRF in MCUSR. See “MCUSR – MCU Status Register” on page 45for description of WDRF. This means thatWDE is always set when WDRF is set." First look at the main(). This is pretty standard C code for setting the WatchDog up to wake us, then enabling sleep, and then actually sleeping. The main() only gets called once at power-up. Now look above it at the .init0 routine. This little bit of assembly code gets run right after a reset before anything else happens. It checks to see if we just woke up (as opposed to just powering up) and if we did, it jumps straight into our warmstart() code. It skips eveything that normally happens on a reset like setting up registers and initialing variables. This stuff is slow and would delay us from doing the work that we woke up to do, and worse it messes up variables and registers that it might be nice to keep intact between wake ups so we don’t have to keep figuring them out over and over again. You could also do this by having the WatchDog timeout trigger an Interrupt routine, but since we are just going to be sleeping between WatchDogs, this is wasteful. Interrupt routines assume that they will be “interrupting” other running code so they do a lot of work saving and restoring stuff that we just don’t need. We want a quick wake-do-sleep! Once into warmstart() we are ready to immediately do our work. All global variables are preserved between between wake ups. The only overhead in warmstart() is getting ready to sleep again, which is a single assignment to MCUCR and setting the timeout again in WDTCR. You might wonder how we can get away with not needing to enable to the WatchDog again (which can be a complicated affair). It turns out that if we leave the WatchDog Reset Flag alone, it will override the WatchDog enable bit and let the WatchDog continue to repeat fire automatically! Handy! What about setting the WatchDog timeout? In this case, I am using the 125ms timeout, but you could change this to anything you want. If you happened to want the 62ms timeout, you can actually delete this line altogether since that corresponds to all zero bits, and this will be the default value in this register after reset. Note that anytime we reset (on power-up, or waking with a WatchDog) all I/O registers are set to their initial values. For most things (like DDR and PORT registers), this is zero, but you can look on the data sheet for the chip to see what the initial value for any individual register is. In Ognite this is great since it saves us a little work zeroing out the DDR registers. So, now that we know what all the extra stuff is- and we know that we don’t need it- let’s get rid of it! Here is the final program..
// vectors typically go. The location of the "vectors"
// section is set inside the linker script. It does not look very different from the original program. This tells the compiler to tell the linker to put our code at the very start of program memory at location 0. Now the first byte of our program is sitting right where the Reset vector would normally go, so our program will start running as soon as the chip powers up. We will be running “bare metal”. Keep in mind that even though the changes we made to the code were very small, it took a long way to get here. If you just make these changes without understanding each thing we got rid of, you can get into trouble fast. If we decided to expand this tiny program and tried to add an interrupt to it, things would fail hard when the chip jumped into the non-existent interrupt entry in the vector table. If we did something as small as adding a statically initialized global variable, it would not work because we are not running the normal C start-up code that does the initialization. Heck, we would not get far trying to write any real program without the code that normally zeros out R1 since lots of compiled C code takes that for granted. So was this just a silly exercise? No. The production Ognite code very carefully works around all these issues while at the same staying significantly smaller than if it used the normal C start-up stuff. Is the space saved worth it? Maybe not for most programs but if you are designing a product that you expect to make 1,000,000 copies of, then using these techniques may let you fit into the next size smaller chip which could have a huge total impact.